Can’t quite believe I’ve just finished and posted another 10 painting order for Whitby Galleries. Wow! There’s no rest for the wicked either as I already have another order lined up for early next month. 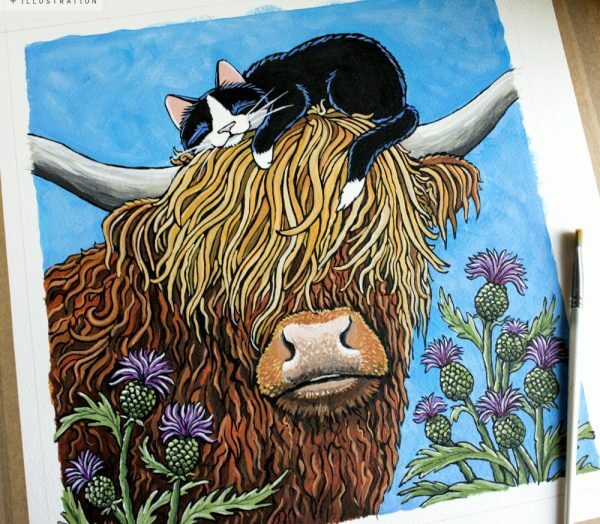 No cats involved (the shock, the horror) but more about that on another day because today it’s all about Halloween cat paintings! 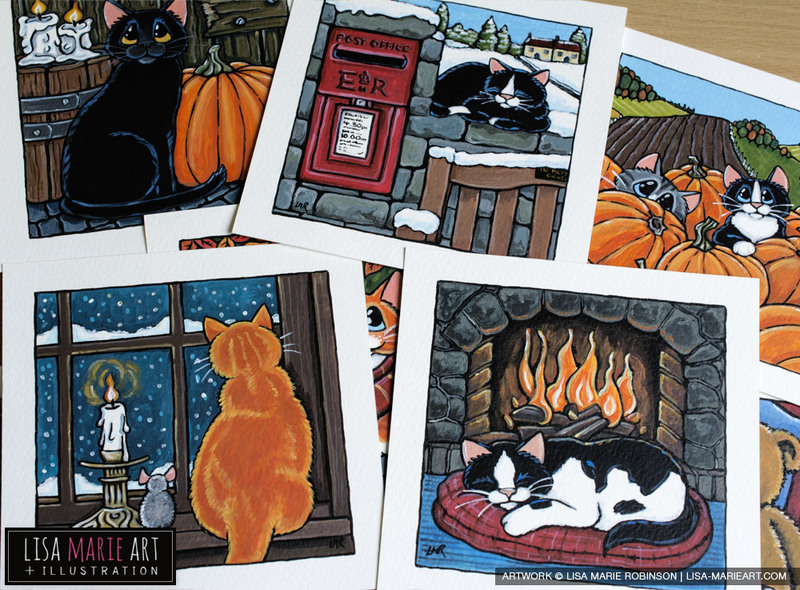 I love it when October arrives because I get to paint lots of Autumnal, Winter and Halloween inspired cat artwork. This order includes at least one of each of those themes so we’ll kick things off with the Halloween cat paintings and Autumn! ‘Number Two’ is a scarf-wearing ginger tabby cat enjoying the autumn breeze beside a wooden gate. ‘Pumpkin Jack’ features a black cat posing with a very large pumpkin and melted candles. 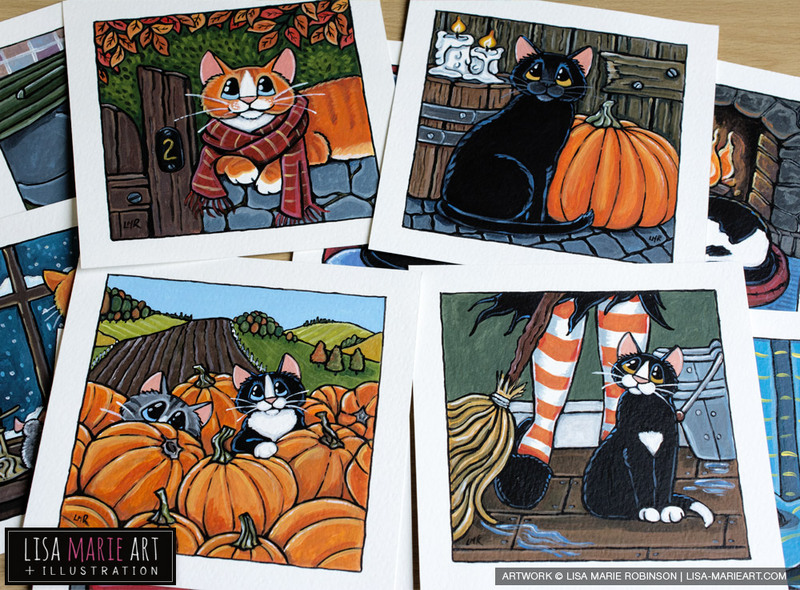 ‘Pumpkin Pile’ features 2 cheeky kitties playing hide and seek amongst pumpkins, and finally, ‘All Hallows Morning’ is a tuxedo cat ‘helping’ a slipper-wearing witch to clean the floor. It’s getting a lot colder now so I’ve also included a few Winter inspired paintings. ‘By Mail’ features a tuxedo cat sitting on a snow-covered stone wall beside a country postbox. 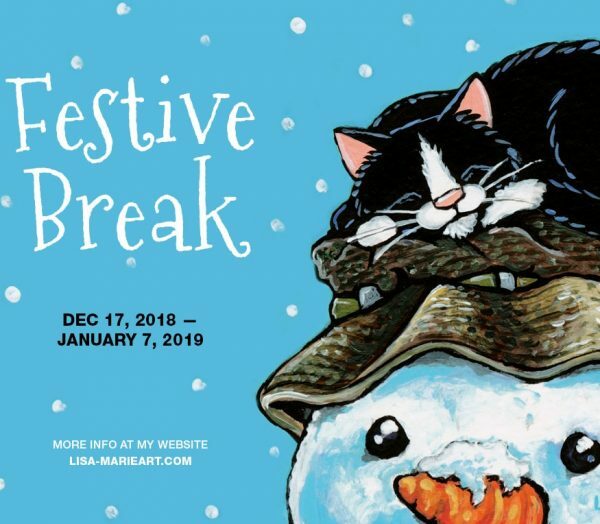 ‘Snow by Candlelight’ features a ginger tabby and a little grey mouse watching the snow falling through a window, and ‘Warm & Cosy’ is a black and white kitty enjoying a snooze in front of an open fire. 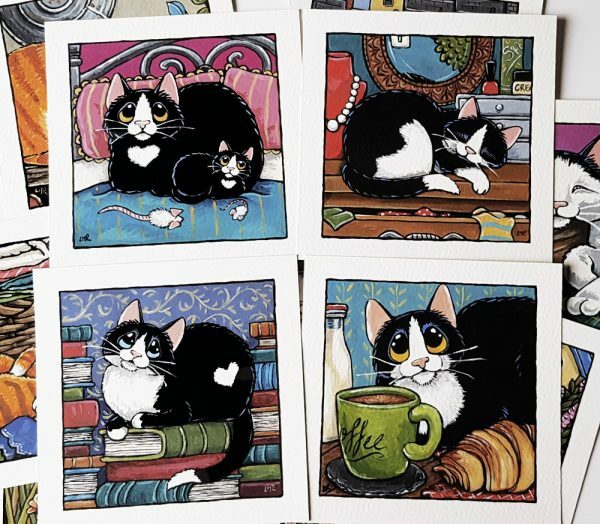 The last 3 paintings feature cats in the home. ‘Widget & Ted’ is a tuxedo cat and his favourite teddy bear sitting on a blue chair. ‘There Goes the Curtain’ sees a mischievous kitty trying to hide in the curtain which he’s just pulled down, and ‘No Room’ is what happens when your kitty decides the bread box is the perfect place to sleep! 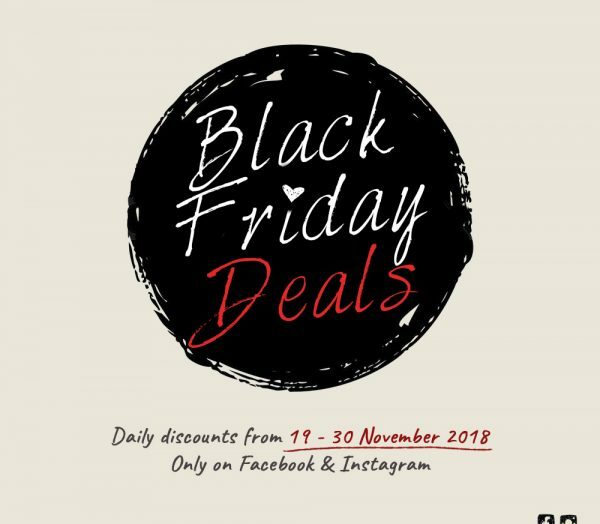 Simply pop along to Whitby Galleries, located at 134-135 Church Street in Whitby, or if you’re unable to visit in person orders can be taken by phone or email and home delivery can be arranged. As always, please contact the galleries directly with any enquiries about these paintings. 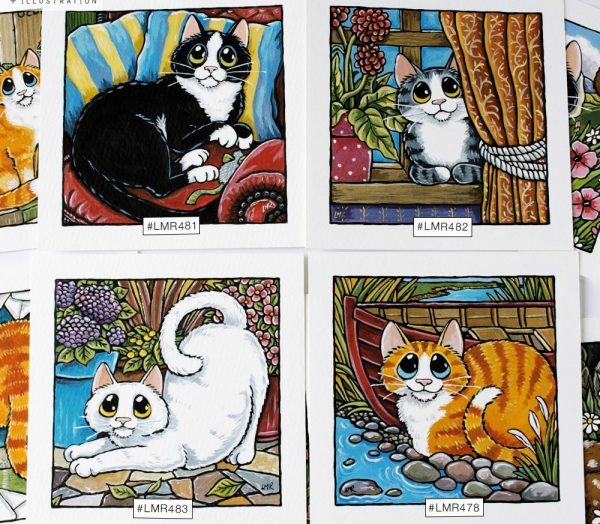 Each one is fully framed and the artwork itself measures approximately 5″ x 5″. Paintings from this order should be available for sale from October 24th onward. Hope you all like this month’s seasonal bunch. 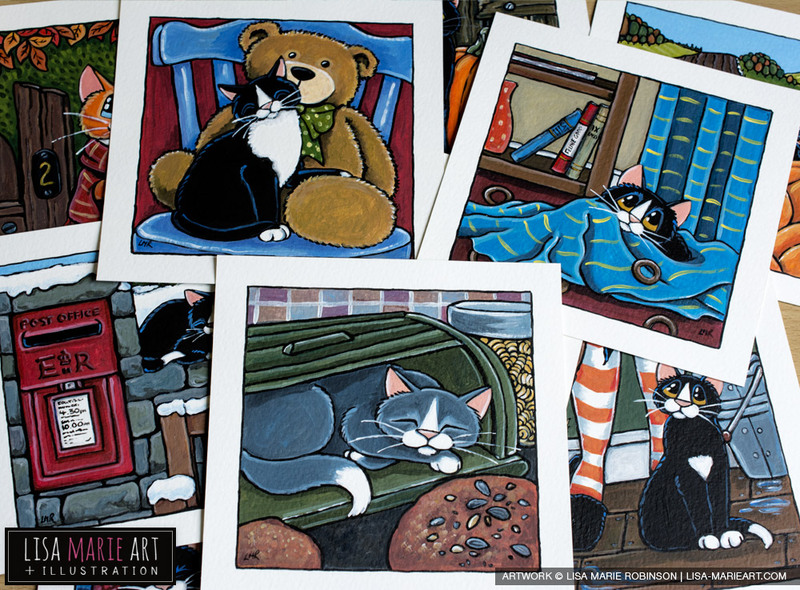 Massive thank you once again to everyone who has purchased my kitty paintings from Whitby Galleries. Hugs!